From hard rock and fruit to pirates and space; CasinoPop’s new promotion will let you experience games from all kinds of quirky themes. Sit back and relax with your favourite games, and you could go home with hundreds of bonus spins or a generous money prize in your pockets! 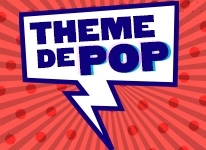 Theme de Pop is running at CasinoPop until the 1st of June, and it consists of daily leaderboards and a grand prize pot of £2,500 in cash. Play your favourite slots or try out some of the selected themed games that CasinoPop have handpicked, and see if you’re dedicated enough to climb to the very top. Everyday during the promotion, a new leaderboard goes live at precisely 18:00 CET. For every £1 you play through on any of the games in the casino, you’ll add one point to the board. The only exception to this are table games - you’ll only get 1 point for every £10 you wager through on them. The twist is that each day comes with a unique theme, and if you play any of the selected games your points will be boosted with 20% extra. Additionally, your biggest win of the day will reward you with 10x points. It’s important to note that you need to bet at least £1 per spin in order to qualify for the tournaments. The daily prize pool is sprinkled with hundreds of valuable epic spins and regular bonus spins, and the top place finisher of each tournament can enjoy 150 epic spins on one of three NetEnt games. Check out today’s tournament, and continue reading to see what else you can win! In addition to the daily tournaments, there’s a main leaderboard where £2,500 in cold cash is up for grabs. Drop by the promo page at CasinoPop where you can see a list of the players who are currently in the lead. There’s still enough time to steal the first place finish, and the prize for doing so is £500 in cash. There are 15 cash prizes in total, so try your luck and see if you can secure yourself an extra payday. Click on the link to read everything about the Theme de Pop promotion for yourself, and create an account at CasinoPop to experience a fantastic UK casino where frequent rewards and generous bonuses are waiting for you!